An event of major importance in Canadian theatre history is happening this year in St. Catharines, Ontario. There the first theatre festival ever dedicated to a Canadian playwright has started – a playwright who is not only Canadian but still living and writing. This is the Norm Foster Theatre Festival, called the Foster Festival for short, celebrating the works of the man who is Canada’s most-produced playwright. For at least the past twenty years there have been on average 150 productions of his plays every year. In 2016 alone productions of Foster’s plays are scheduled in seven provinces, sixteen American states and in Australia, Belgium, Ireland, Italy, Mexico and Poland. The first of the three plays at the Foster Festival is On a First Name Basis from 2013, starring Foster himself. Foster is often called the Canadian Neil Simon because he has written so many popular comedies. Yet, First Name shows the limits of that comparison. Simon’s characters are more aggressive and obnoxious, the language more given to one-liners and creative insults than to reproducing the way people actually speak and the action more plot- than character-driven. In First Name, Foster manages to construct a two-hour play where the action consists entirely of a conversation between two characters. The conversation keeps us riveted because we become so involved in the characters and and so intrigued by what its outcome will be. The situation could hardly be simpler. David Kilbride, (Foster) a successful spy novelist, comes to realize one day that he knows almost nothing about the woman, Miss Hopperstaad (Patricia Vanstone), who has been his maid for the past 28 years. He is disgusted with himself that he doesn’t even know her first name. Therefore, he proposes that they drop the master-servant proprieties for a few hours and get to know one another as if they were “chums”. At first it is difficult to get the very proper and rather prickly Miss Hopperstaad to relent, but with the aid of a few tumblerfuls of scotch, each tries to draw the life story out of the other as they move into ever more increasingly personal details of their private lives. constructed her view of her employer. Yet, these suppositions only go so far and there are key aspects in the life of each that come as a surprise to the other. Already the notion of people comparing constructed narratives of each other’s lives with reality shows that Foster is writing at a level of sophistication beyond anything that Simon attempts. Foster cleverly is able to derive humour both from the correct and the incorrect guesses that each makes about the other. What is so remarkable about this laugh-out-loud comedy is that its themes are so serious. Not far beneath all the levity are fears of loneliness, pointlessness and mortality. Far from diminishing the comedy, these themes give it more realism and poignancy. 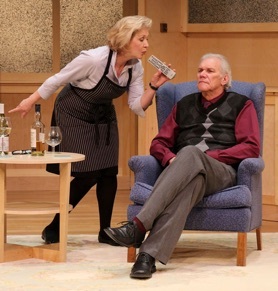 Foster and Vanstone created the roles of Kilbride and Hopperstaad under David Nairn’s direction in 2013. One could hardly imagine more authoritative performances. 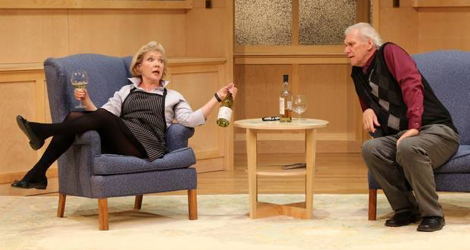 In terms of acting alone, both Foster and Vanstone could stand to show more fully the debilitating effects of all the alcohol they consume on the characters they play. Otherwise, Foster’s writing itself indicates how Kilbride’s superior, curmudgeonly edge and Hopperstaad’s oddly formal manner of speaking gradually wear off over the course of the two hours. Both characters have greater emotional arcs to cover in Act 2 than you could ever imagine simply from Act 1, and both Foster and Vanstone are unafraid to plumb those depths. Peter Hartwell has designed a beautiful slightly abstract set to represent Kilbride’s library where all of the action takes place. The set is constructed of the same natural wood that makes Cairns Hall (the smaller theatre inside the lovely new FirstOntario Performing Arts Centre) so handsome and inviting. Making the set seem to be a part of the theatre, of course, only enhances the theatrical nature of a play about people constricting stories about each other. I must confess that although I have been a theatre critic since late 1999, On a First Name Basis is the first play by Norm Foster I have ever seen. Many people in Toronto, the only Canadian city where Foster has rarely received any professional productions, paradoxically tend to conceive of his enormous output and huge popularity as faults. Though not a Torontonian of that sort, seeing this production of On a First Name Basis opened my eyes to why Norm Foster is so widely produced. Not only is a play like First Name extremely funny but it also never loses a sense of the characters’ common humanity. I very much look forward to the next two plays at the Foster Festival. It is has just made a visit to the Niagara region even more attractive. The Foster Festival runs from June 15 to August 27. Next up is Here on the Flight Path July 13-30 and the world premiere of Halfway to the North Pole August 10-27. Photo:(from top) Patricia Vanstone and Norm Foster; Patricia Vanstone and Norm Foster. ©2016 Foster Festival.